I’ve been tracking my trading on options for the past 3 months, and I put together a little chart. My trading has been very frustrating. No matter what I do, I always seem to give money back to the market. I started out with a trading timeline of 3-5 days and extended it, and figured out that was a mistake. When I switched, I made money. Now, even 3-5 days is too long. I have lost money on 6 out of my last 7 trades. The frustrating thing is that all of them were profitable at one point. Every single one. Out of my 14 losses, all but 4 were profitable at some point. You can see I really have not made any money (the green is my total overall profit). I make some money and give it back, make some and give it back, make some and give it back… If I go long, I am up and then the market takes it away to reduce my gains by 30%. If I go short, I get up by 25% and then the next day I am down 25%. Protect capital. 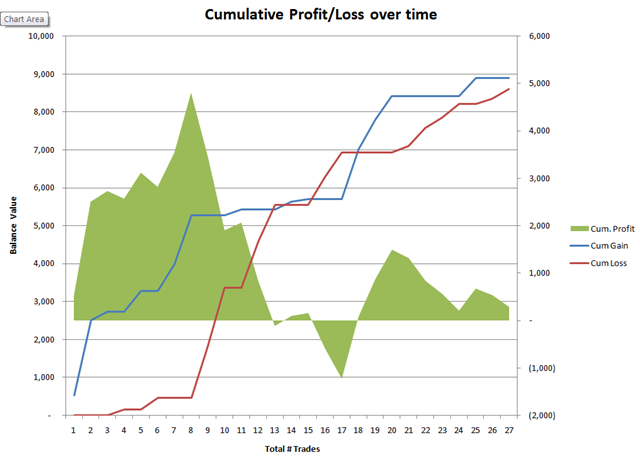 My initial losses were my smallest and my middle losses became much, much larger. However, after that, after my recent string of four in a row and now two in a row, those did become smaller. Over my last few bad trades, I have been quicker to reverse my position and get out when the market starts to go against me. Before, I would get out when it went against me too far, now I get out sooner than that when I think it’s going against me. In other words, I wait for confirmation much, much sooner. Consistently make money. This is the goal that has been so very elusive for me. No matter what I seem to do, I can never hold onto those gains. I started to play around with the idea of (trailing) stop orders, that is, when the stock goes down to a certain price, it executes automatically. I had not been doing this because I wanted to let my positions ride and give them room. I am now finding that virtually never works for me. All it does is give the market time to erase my losses before I turn on my computer. In five of my past six losses, stop orders would have kept all of my losses as small gains. For my gains, it would have hurt me by taking me out too soon with a stop order, but a trailing stop order once I am already up would seem to work. Hit the occasional home run. Ah, this is what got me hooked on options trading to begin with – the ability to double my money in a short time frame. I have managed to do that a few times early on, only to give back everything in short order. But I know that I can do this and with options it’s only a matter of time before I do it again. Looking at it this way, I see that I am probably not that far off from achieving (2) by refining my strategy. I have managed to make progress by making my time frames short. I know now that in an uptrend, I have to trade more volatile stocks in order to make it worth my while to catch a down movement. I went long on CREE again today (after having gone long last week) because I think it has pulled back to a logical entry point. I resisted getting into another position because I have been trading so poorly lately. However, if I can discipline myself enough to put in a trailing stop after I am up a certain point, then I can let myself collect profits and then wait for the next entry point. I have now made 27 options trades this year, this is not yet my most busy trading year but by the end of 2010 it will be. When it comes to the end, I think I will have a pretty good view at how good (or bad) a trader I am and if I have made improvements over time. The chart above currently says no. A couple of weeks ago, I booked a trip to Central America. This is the same one I was talking about earlier. Myself and my girlfriend, who is also really big into traveling, are doing a trip to Belize with stops in Guatemala and Honduras. Interestingly, she has probably traveled a bit more domestically (ie, within the United States) than I have. I’m actually quite looking forward to this trip, probably even more than my trip to Peru last year. Even though this trip does not contain any locations on my list of life-long dreams, it does contain some stops at various ruins, including Tikal, Guatemala. I like ruins, and this trip will also have time to do scuba diving. I haven’t done scuba since I went to the Great Barrier Reef in 2006. We were originally thinking about doing New Zealand but ended up switching to Central America. With my condo still sitting empty and draining me every month, I can’t really take the financial risk of doing a larger trip. The airfare, including taxes, to go to Belize is $623, whereas a trip to NZ is about double that. Furthermore, the cost of “living” in NZ is higher than it is in Central America so that also factored into the decision. Finally, Central America has warmer weather than NZ. Even though we would be going in summer in the southern hemisphere, we’d be going mainly to the south island which is cooler. In Invercargill, the southern-most town in NZ, it was only about 58 F on Dec 3, 2009, the same temperature it is here in Seattle in winter (on a nice day). Actually, that’s not that far off from an atypical summer day in Seattle… Thus, if we want to go in summer and can expect it to be like the Pacific NW, that’s not a guarantee of nice weather. The fact is that we both want to go someplace warm. Last night, I was given a cruel reminder of what can happen when you travel out of the country. I had some pizza around 6 pm, and then around 8 pm I went to the gym to work out. On the ride home, somewhere around 9:30, I started to experience pain in my stomach. By 11 pm, my bowels and intestines had conspired to declare a jihad on me, requiring several trips to the bathroom. But if that wasn’t enough, the pain in my stomach wasn’t a normal stomach ache. It was so bad that at one point it literally brought me to my knees, causing me to groan in agony. It hurt. At one point I wondered how I could keep going to the bathroom because I thought I was “emptied out.” I was proven wrong. The reason I bring this up for traveling outside the country is that the last time this happened, I was in Peru. Me and my friend Frank had gone out to dinner in Nazca and, coincidentally, I had pizza. Later that night, I was awakened to a severe pain in my stomach. Over the course of the next two hours, I required several trips to the bathroom. Not only that, I was similarly writhing in pain. Only two weeks before that, I had a similar episode when I ordered a pasta carbonara dish at a restaurant and experienced similar discomfort. The point is that my misadventure in South America is not that dissimilar to other friends who visit Mexico – going down there, the food and cooking oils are different and many people get sick, just like I did in Peru… and did last night. I am now a little worried about getting sick in Belize/Guatemala/Honduras. When I went to Peru, I brought along a lot of stuff for sinus congestion since that’s how I usually get sick when I travel. I never considered that my stomach would also give me problems. But as I have gotten older and started clamping down on the foods I eat, my stomach has not gotten more resilient. In fact, it’s the opposite; it has gotten more finicky about what it finds to be acceptable. A lot of rich foods it rejects within 1-2 hours after consumption (sometimes as early as 15 minutes). And if what happened in Peru and last night happens again, that’s going to make for a less enjoyable experience. But I did learn one lesson – always bring enough antacids, Pepto Bismol and Tums to last a month. I’m probably going to need them. Do I prefer hot weather or cold weather? I’m from Canada, which is a cold country. We can count on cold weather pretty reliably from November through until April each year. We may have warm days in March, but they are unpredictable. If March is cold and miserable, nobody would be surprised. If April had snow, nobody would be surprised. So, it should come as no surprise to people that I am not a big fan of cold weather because I dealt with extreme cold for many years of my life. If you combine that with the fact that I am rather thin and have very little body fat on my upper body (which causes me to get colder faster than most people), you can forgive me if I am not thrilled by the prospect of cold weather. Or cold anything. Swimming in cold water is something to which I’d say “Pass.” I have no insulation and would be affected by the effects of exposure quicker than the average person. But does that mean I prefer hot weather? For example, if I were to travel someplace, would I prefer it to be hot? This past weekend, I went up to the San Juan islands in northern Washington. While we were there, in the morning it was a little cool but it eventually got really warm. It got so warm that I ended up feeling really sluggish throughout the day. I have traveled to a number of very hot places (Fiji, Singapore, Australia, Mexico) as well as dealt with very hot weather in my regular life during the summer. They all have the same tendency, and that is to slow me down and make me feel sluggish. I contrast that to some of the cooler weather places I have been – Peru, New Zealand (it was never hot there, only warm), Switzerland, and China. At these places, while it was pleasant enough for me to walk around in short sleeves some of the time, most of the time I had to wear a light jacket in order to stay warm. It just didn’t get hot. It was never cold, but not wearing a jacket at night would have meant I would have been cold. So which do I prefer (when I travel)? I think I like the cooler weather better. Sure, in hot weather places I can wear shorts and sandals with a minimum amount of clothing which eases the burden, but the hot weather always manages to put me into a lethargic state. Cold weather is less pleasant, though, because that prevents me from even doing anything outside. But I think I like warm weather that is in the mid-20’s when I travel (that’s 70’s for you Americans). Warm enough to walk around outside in sandals and no jacket, but not so warm that I want to sleep all the time. I may not be able to go to the beach, but at least I will not get sunburned and I can walk around no problem without overheating. Last week, I was expecting the market to go down. There were a bunch of stocks I was further expecting to weaken and fall a significant amount. I ended up buying put options in 3 positions and 2 days later (last Friday) I was up 25% on my money. All of my market signals suggested lower prices were soon to follow and that I should hang on, even though I only like to hang on 3-4 days. At 2 days I figured I was safe. Monday came by and it was an up day. No biggie, nothing goes down every day in a bear market. However, on Tuesday the market had a big up movement although it was a weak movement with a possible head fake. Wednesday it started strong and faded into the close and I figured that my initial analysis was right: it was still a correct (bear market?) and that there was more weakness to come. However, today (Thursday), I have to change my tune. I have to flip my bias to up and that the earlier weakness is fading away. My 25% gain in 2 days is now a 30% loss in 6 (6 trading days, 8 calendar days). 6 trading days is too long for me to hold anyhow, I should have sold after 3 days – my optimal holding period. Not sure why I held on more, that wasn’t a good idea. Below is a stock, CREE, that I bought a call option on at 5.15 and last Friday it was at 7.2, which is a 40% gain in 2 days (before trading fees). Yet today I had to sell at a loss. You can see that after it peaked in April, it came down to test the 60 level 4 times. However, this last time it failed to test the 60 level and it seems to have broken out above it’s previous high as well as broken the trendline. To me, this indicates a change in trend from down to up, and that’s where fortunes are made (supposedly). I decided to go long here and picked up a couple of options. Hopefully I can recover those losses. I don’t mean that I have the ability to go backward or forward in time (anymore), but rather, when it comes to the concept of time, I am a machine. Yesterday, I was driving over to my girlfriend’s place and I got a text asking when I might get there. I was driving along the highway and I checked the time and estimated where I was. I then texted her back and said “15 minutes.” I continued to drive along and finally arrived at my destination. I pulled up in the parking space, got out of my car and checked the time on my phone. I then checked the time that I sent the message by going through my Sent folder. The difference in time? 15 minutes! Not 14, not 16, but 15 minutes on the nose. I nailed it! Sometimes I am so good I amaze even myself.